This is my first award since I started blogging a month ago, and I’m really excited! The person that nominated me was Jesalin @Jbelkbooks, a big thank you to her! – Answer the 11 questions from the blogger who nominated you. – Nominate some wonderful bloggers and write 11 questions for them to answer. I love fantasy, especially, YA fantasy. I love reading about other worlds full of magic and wonder. What have you always wanted? Did you get it? This is such a hard questions. I think what I always wanted was to figure out what I wanted, and I still haven’t. I think my greatest weakness is my laziness, if I could do nothing all day I would. If you could wake up tomorrow in someone else’s body, who would you pick and what would you do? I think my honest answer to this is Taylor Swift. I would love to performe at one of her concerts. Marvel or DC? If neither, tell why. That’s so hard! I would say Marvel, if I had to choose, but honestly, both. Chocokrispis… I know it’s weird because is a cereal, but it’s chocolate-flavored. I just love it! I love the sea, but I hate the sand. So I would say, mountains. What are you currently reading? Do you enjoy it so far? I’m reading Bestiary by Julio Cortazar, because my boyfriend gave it to me as a present. I don’t know how I feel about it yet. I watch tv shows, go to the cinema, read books, and hang out with my boyfriends and my friends. Maybe? I’m not sure. I think so. Do you read graphic novels? Do you have recommendations for someone who wants to start reading them? Do you have a genre that you really don’t like? One you never read? Do you read fantasy? What’s your favorite fantasy book? Do you dislike a ship that everyone else likes? What book to movie adaptation is your favorite? Do you listen to music while you are reading? What’s your opinion about classics? Who is the author you have read the most books from? If you decided to answer the questions, let me the link, I would love to see your answers! I plan to have mine up sometime next week. Thank you for much for nominating me!!! This means a lot. By the way, I'd love some chocolate ice cream too!!! Side note, I've also nominated you for an award!!! Thank you , Sofia! It means a lot to know that people are starting to read my blog! 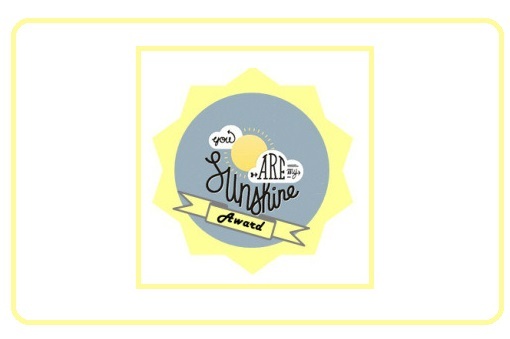 Here is the link to my post on the Sunshine Award: http://ponderingtheprose.blogspot.com/2015/08/sunshine-blogger-award.html Thanks again for being such a positive blogger yourself!